Advances in structure-function analyses and computational biology have enabled a deeper understanding of how excitatory amino acid transporters (EAATs) mediate chloride permeation and substrate transport. However, the mechanism of structural coupling between these functions remains to be established. Using a combination of molecular modeling, substituted cysteine accessibility, electrophysiology and glutamate uptake assays, we identified a chloride-channeling conformer, iChS, transiently accessible as EAAT1 reconfigures from substrate/ion-loaded into a substrate-releasing conformer. Opening of the anion permeation path in this iChS is controlled by the elevator-like movement of the substrate-binding core, along with its wall that simultaneously lines the anion permeation path (global); and repacking of a cluster of hydrophobic residues near the extracellular vestibule (local). 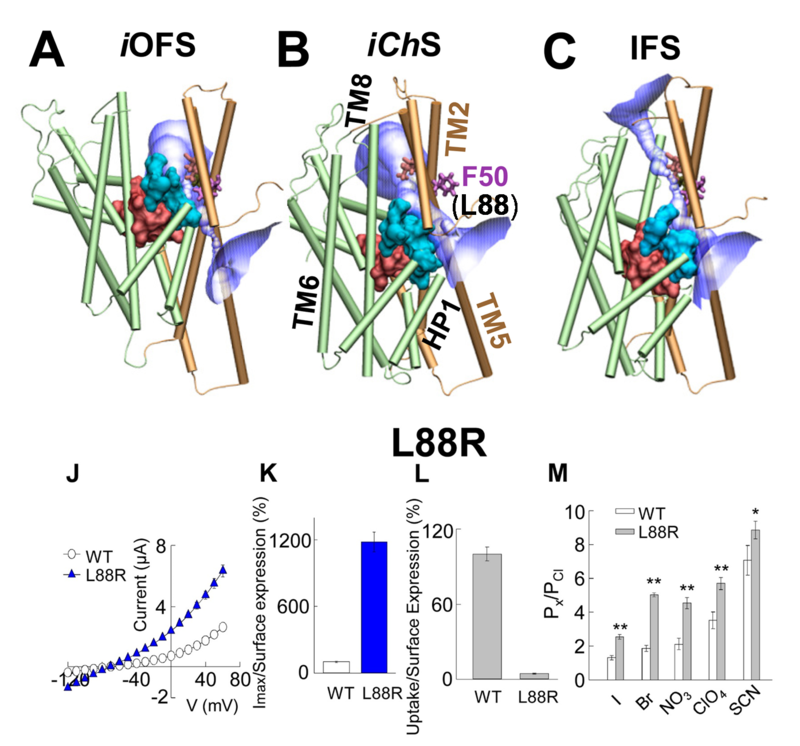 Moreover, our results demonstrate that stabilization of iChS by chemical modifications favors anion channeling at the expense of substrate transport, suggesting a mutually exclusive regulation mediated by the movement of the flexible wall lining the two regions.